Out of 3 finalist from Texas, Camille Fournier of Spartan Mat Club makes it through to the top of the podium with a fall in the 2nd period over Rose Ann Marshall of Team Wisconsin. this will keep her in the top of the National rankings where she is now #6. 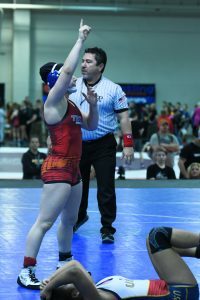 At 94 weight class, Crystal Venegas of Ohana Wrestling Academy lost 4-2, and Samara Chavez who ranked #7 nationally takes a loss to Olivia Shore of Ohio who is ranked #3 Nationally at 100.